The last few weeks have been busy busy. Me and Aaron have been making some massive improvements to Pigeon. Most of the Akka features are now completed, remoting still needs some love and after that we will start porting Akka clustering. One of the latest features we have added is logging. We support the same features as real Akka, so logging can be done using the ActorSystem.EventStream, and there is also a BusLogging LoggingAdapter. We are also leveraging the real Akka config, so we can enable logging based on the same configuration options that Akka has. Alot of the existing features have also been refined to conform even more to real Akka, e.g. ActorSelection have been rewritten to behave exactly like in Akka. ActorRefs are now also serializable in messages, so you can send messages containing actorrefs across the wire and use them on remote systems. The Akka RemoteDaemon is also coming along nicely, so we can create actors on remote nodes this way, the underlying deployment features are however not completed yet. The Props class have also gotten new features, we can now configure dispatchers and mailboxes via the config and there is also a new dispatcher that lets you run actors in the main thread, to allow GUI updates in WPF/WinForms. 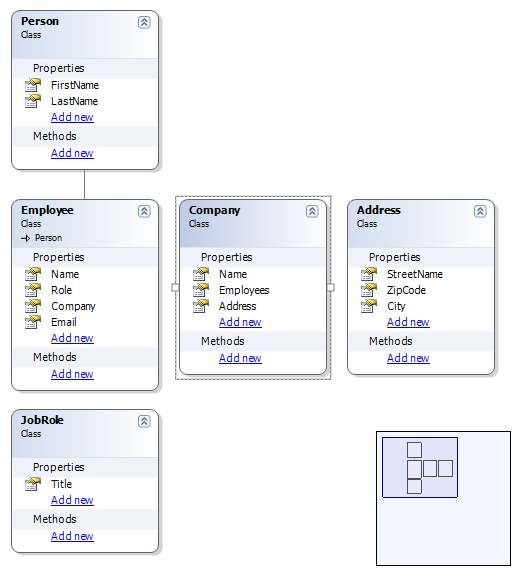 I have published my class designer component at CodePlex. AlbinoHorse is a Windows Forms control for UML Class diagrams that I’m currently developing. I’m still working on my Lisp language clone. Today I started to add debugging support to it. I made the AST aware of the original source code, so each node can reference back to the place it was parsed from, and I also added a bit of call stack features. Anyway, here is a screenshot of the not so well designed GUI. I’ve been reading up a bit on functional programming the last few week, the reason is just to comprehend the new features and possibilities in .NET 3.5 as much as possible. Anyway, I got a bit carried away and started to read about Lisp, and decided to learn what it’s all about. I started to hammer away on a simple parser, and once the parser was done, I couldn’t stop, so I began writing an engine too. Well, enough blabbering, here are a few samples of whats currently possible in my still un-named language. (let print other-print-func) //redirect the print function to "other-print-func"
The next step will be to make it possible to define your own classes. Im thinking of emitting true .NET classes and let the methods redirect the calls to the engine. Thus making it possible to redefine the behaviour of a method in runtime.